All the accounts features are available from one responsive Cpanel homepage. Scaler: you can change the size of images in a directory. The file manager from Cpanel is really great because it has so many features so that you don’t an FTP client. For example, there is a search and replace tool to modify text. You can also undo/redo your changes. Also, every line has a number. Also, the file manager “understands” the code and change the code color accordingly. It is possible to compress and uncompress files and folders right from the file manager. You can also move/copy/duplicate files or folders. You can move and copy files and folders without fearing to do something bad or getting the wrong user permissions. You can also compress and uncompress files and folders right from the file manager. This means that most of the time with the Cpanel file manager, you don’t need to install an FTP client. You can set up a password to access folders from the Cpanel account. You can create several users with different username and password. You can use WebDav to manipulate your files and folders instead of FTP or SFTP. You can create additional Web disk user access. You can create additional FTP user accounts from Cpanel with an access to a specific folder. FTP connections can be monitored in real time. A full website backup can be downloaded. You can also download a backup from a previous day if the web server administrator has set up an automated backup for your account on a daily basis. You can also download partial backups like MySQL databases, home folder backup. 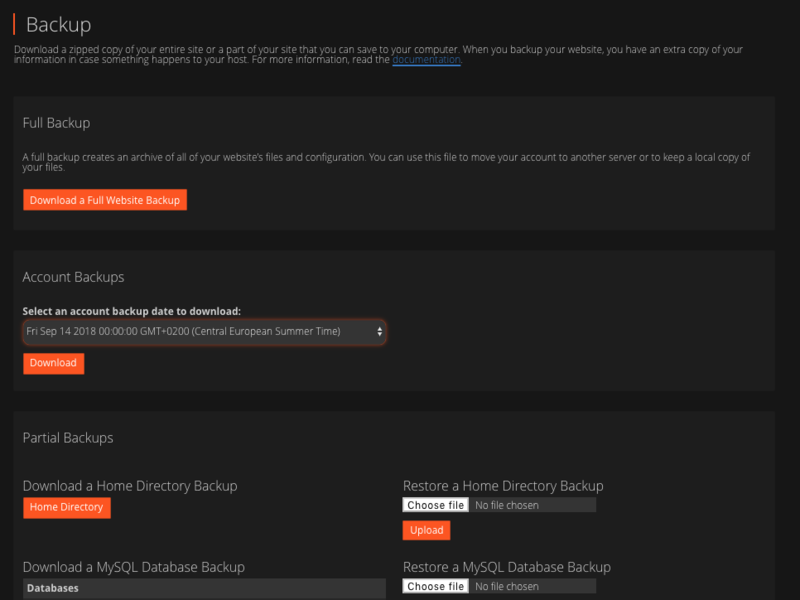 You can also restore the home folder or a MySQL database from the backup section. 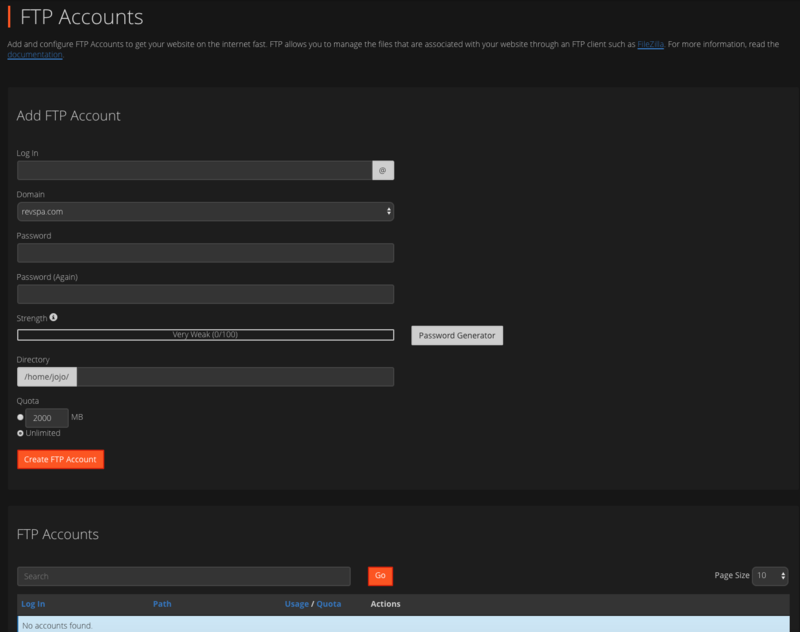 There is also a backup wizard which allows to backup everything from your account: Home directory, MySQL databases, email forwarder configurations, Email filter configurations. Cpanel also features a very useful and safe way to restore data. It is called the File & directory restoration. 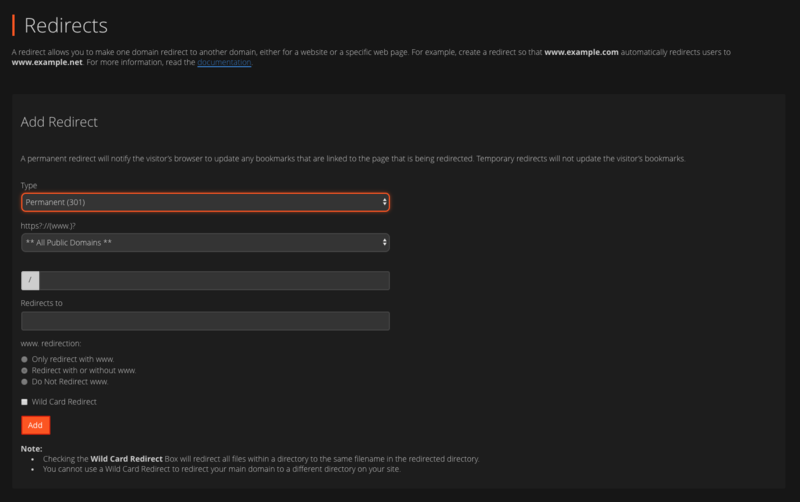 You can restore an addon domain folder using this feature if the web server admin has set up a automated backup for your account. PhpMyAdmin allows you to access the databases and tables from your MySQL or MariaDB installation. From Cpanel, you can create new databases and new database users. Database user Permissions can be set up right from Cpanel. You can also change the name, change the password of a user, check and repair databases. You can also manage remote access to your MySQL database from Cpanel. In Cpanel, the first domain that you create for an account is called a primary domain. The subsequently created domains are called addon domains. When you create an addon domain, it should point to a folder on the web server. From the addon domains section in cpanel, you can redirect the queries to an addon domain to another URL. When you create an addon domain in Cpanel, the DNS records are automatically created in the background. This includes A, AAAA (if IPv6 is set up), MX, DKIM and SPF records. The subdomain section allows you to map a subdomain to a folder on the web server. When a subdomain is created, DNS records are automatically created for the subdomain to be available right away. This includes A, AAAA, MX, DKIM and SPF records. 301 or 302 redirects can be created from Cpanel. This can be a full website redirect (Wildcard redirect) or folder redirect. The Cpanel user can modify DNS records only if the web server admin has decided to allow this feature. Then, it is possible to add A, AAAA, MX & TXT records to any primary or addon domains. From the Cpanel you can fully manage email accounts. The storage space / quota can be monitored from the email account section. You may also decide to suspend the log in to an email inbox, reception or dispatch. You can also access the webmail without login again. You can forward emails to another email address. You can also create a catch-all to receive all the emails whatever the name of the mailbox. The user can also set up autoresponders for an email address. Several mailing lists can be created from a user account if the web server administrator allowed it. From the Cpanel account, you may monitor delivery tracking. you can import email addresses. It is possible to set up a calendar and an address book for every email address. Then, you can access this calendar or address book from a CalDav or CardDav client like Mac OS, Mail from Windows 10 or Thunderbird. 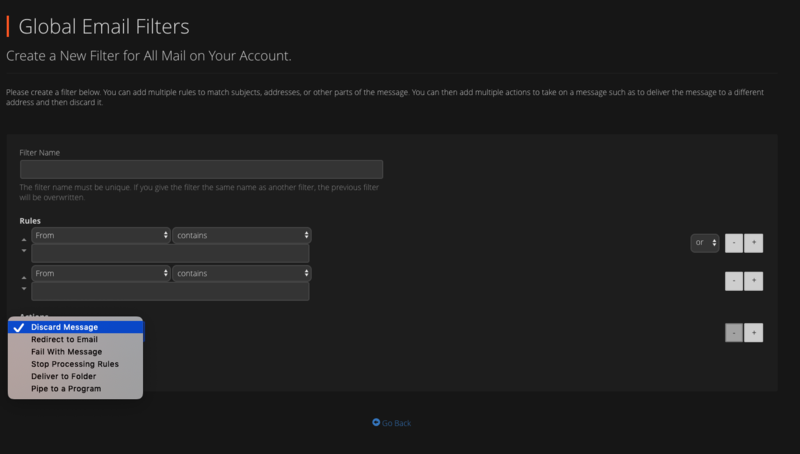 You can create either global email rules or email address rules in the sections global email filters and email filters. The criteria are the same criteria that you would find in a mail software like apple mail or thunderbird. This can be handy to block spams from a specific email address or a sender. You can also use it to copy the emails to a special folder or pipe it to a program. You can determine what should be the strength of your spam filter. You can also disable spam filter if you want. The Spam feature is a global feature. In other words, it is not an email address specific feature. You can import or generate a 4096 bit or a 2048 bit GnuPG public and private key from a Cpanel user account. The webmaster can check the last visitors, the last Apache errors for every domain from the account. The bandwidth section is very useless to see how much data has been downloaded from the server. “Raw access” allows checking the logs of a domain. Then, Cpanel features AWStats and Webalizer which are web-based applications to check the traffic to your websites. The bandwidth stats include the bandwidth consumption per website but also the bandwidth by protocol (SMTP, POP3, IMAP, FTP). It is really helpful to monitor these statistics to understand which item is responsible for consuming the highest amount of bandwidth on the server. SSH access generates keys to access your account through an SSH connection. Note that it has to be allowed by the web hosting administrator for this to work. The IP blocker allows you to block a unique IP address or a series of IP addresses. If installed by the web hosting administrator, autoSSL allows you to obtain a free SSL certificate per domain. From the SSL/TLS section, you can install a missing SSL certificate or deactivate the renewal of an SSL certificate. You can also install self-signed certificates from this section. This feature prevents other websites to include images hosted on your web server in <img> tags. This can be free marketing if you there is a watermark on it. However, this can also be a source of bandwidth consumption. max_execution_time This sets the maximum time in seconds a script is allowed to run before it is terminated by the parser. This helps prevent poorly written scripts from tying up the server. The default setting is 90.
max_input_time This sets the maximum time in seconds a script is allowed to parse input data, like POST, GET and file uploads. max_input_vars This sets the maximum number of input variables allowed per request and can be used to deter denial of service attacks involving hash collisions on the input variable names. memory_limit This sets the maximum amount of memory in bytes that a script is allowed to allocate. This helps prevent poorly written scripts for eating up all available memory on a server. Note that to have no memory limit, set this directive to -1.
post_max_size Sets max size of post data allowed. This setting also affects file upload. To upload large files, this value must be larger than upload_max_filesize. Generally speaking, memory_limit should be larger than post_max_size. session.gc_maxlifetime This specifies the number of seconds after which data will be seen as “garbage” and potentially cleaned up. session.save_path session.save_path defines the argument which is passed to the save handler. If you choose the default files handler, this is the path where the files are created. upload_max_filesize The maximum size of an uploaded file. You can schedule cron jobs to be run at certain time of the day / week / month. For example, you can type a command to run a PHP file every day.